Been working on lots of things lately - finishing off a blanket in lavender, purples and greens for a lovely lady who saw me working on the one I made for Marlene - and immediately said she would pay me to make one. I smiled very broadly, thanked her and said "yes please!" 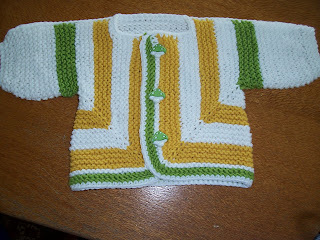 I have been trying to get some baby things finished too. 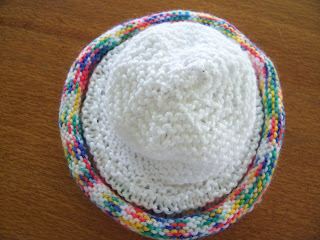 Our summer is about to start so thought some lightweight cotton tops and sunhats would be a great idea for newborns. 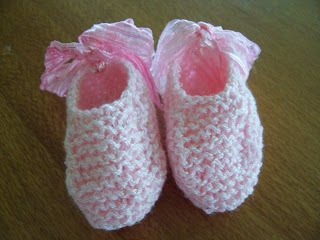 Aren't the little ballet slippers adorable? A friend found them in Creative Knitting magazine and gave the pattern to me! 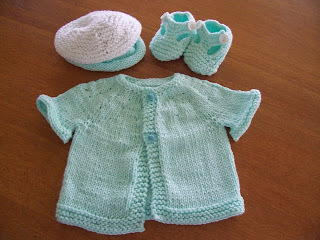 I made this little set in Pink Patons Touch of Ice, with Bendigo Knitting Mills 100% Cotton 4ply in white. The ribbon is some beautiful organza type knitting ribbon (?) well that's what I call it anyway - it was just right for this little set! Look at the cute little doggy buttons! 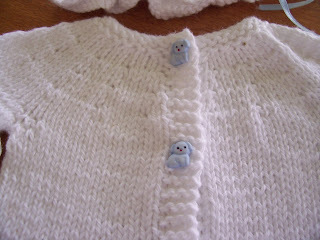 This little white set is in Bendigo Woollen Mills 8 ply cotton. Comes in 200 gram balls for 9.50 ! Order online and postage is very cheap. If you have $30.00 or more in purchases, postage is free within Australia. Bargain or what? are Goodbye Yellow Brick Road. Another girly one in the same colour would you believe as the boy set! It is actually mint green! I took both these pics in the same place a minute apart, wonder why the colour difference in the photo? 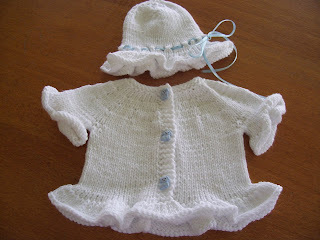 By the way - when using the 8 ply cotton I found a smaller needle works best - I went down to a 3.25 mm for making these. With the 4 ply, I used a 3mm and a 2.5mm! I must say I do love working with this cotton though - so soft and so silky - and it is marvellous when using bamboo needles! 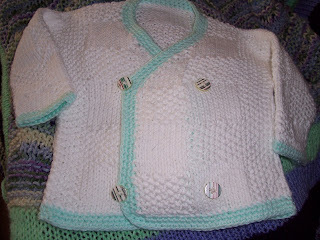 And speaking of Bamboo - I knitted my first garment in Bamboozle by Lincraft. It is 65% Bamboo, 30% Cotton and 5% Elastane. I love the way it knits, so super soft and sumptuous feel - BUT - it definitely slows my knitting down as it is made up of a gazillion little plies, not tightly twisted, so it does tend to split if I am not giving it my full attention! Which led to a bit of "tink"ing here and there - also when I weaved in the ends, I found the ends had a tendency to slip out again. Curses! I had a brainwave though - if I moisten the ends in craft glue - or as a friend suggested - egg white! - they will stay put. Either substance dries clear, and is impenetrable as an adhesive and will not dissolve in washing! But this inconvenience is really minor, because I fell in love with it - the finished article seemed heavy - like using pure silk! Hard to explain.By the way - bamboo needles tend to control it somewhat! But is it difficult to imagine what I made for my first experience using Bamboozle? A tiny BSJ , of course! The Sullivan's Coton-A was a surprise too - I don't like Sullivan's yarns in the main - but this is the loveliest cotton - it is a 5 ply and is so soft and is a dream to knit with! And comes in some very nice bright colours. Could I please say that if you are using egg white to help fasten the ends in - make sure you mark it on a label in case anyone is anaphylactic to egg. Just that small amount would send me to the hospital. I think craft glue would be a "safer" choice. Chris thanks for mentioning it - that improtant fact never occurred to me - so craft glue it is! Phew - just the thought of that happening !! I've been admiring the pink and white sunhat for sometime. Now summer is coming (well, it's supposed to be because July and August are our 2 months of summer, but it's still snowing here in Kananaskis, Canada!!!!) I'd love to try. Can you please tell me how you converted Ellen's ruffled brim to a "flat" brim? 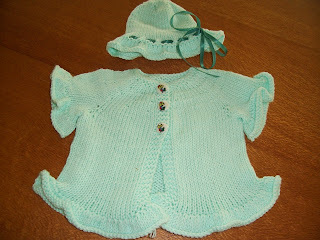 I LOVEEEEEEEEE those little dress looking jackets ..hats and bootied to cute! You always make cute stuff! 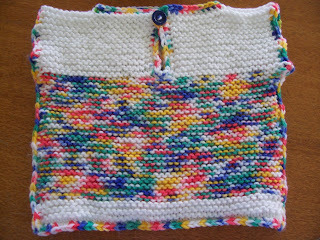 Yes your knitted blanket that you did for me, is keeping me lovely and warm here in Bendigo where it is just 8degrees.